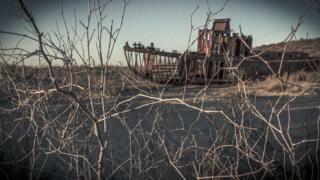 The loss of the Aral Sea in central Asia is an ecological disaster. Toxic chemicals in the exposed sea bed have caused widespread health problems. 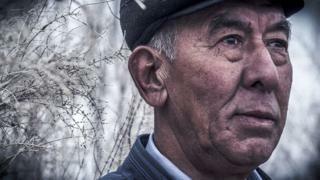 Can an ambitious project to plant millions of trees save the Karakalpak people of Uzbekistan? Seventy-eight-year-old Almas Tolvashev shuffles through the sand towards the rusting hulk of a fishing boat. 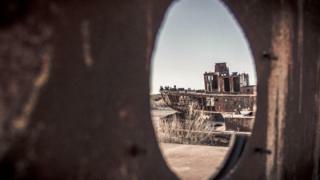 The lighthouse that keeps watch over a crumbling flotilla of 10 or so ships is a stark reminder that Moynaq was once a thriving fishing port on the Aral Sea. "The history of the Karakalpak people starts with the sea," says the former fisherman. "Fishing was the first thing fathers taught their sons". Moynaq lies at the heart of Karakalpakstan, a semi-autonomous republic within Uzbekistan. In its heyday, this is where 98% of Uzbekistan's fish came from. "I was the first Muslim captain in Moynaq and my ship was the Volga. Captains were usually ethnic Russians," Almas says proudly. "There were 250 ships here. I used to catch 600-700 kilos of fish every day. Now there is no sea". The Aral Sea started to shrink in the 1960s when the Soviets diverted water from the two main rivers that flowed into the Aral Sea to feed vast new cotton fields. As cotton production boomed, the Kremlin refused to acknowledge the problem. Locals had to put labelled sticks in the ground to prove the shoreline was disappearing. As the volume of water decreased, the concentration of salt increased, poisoning everything in the sea. "Fish stocks went down and in the end all we caught were dead fish. Now young people have to leave for other countries in search of jobs". 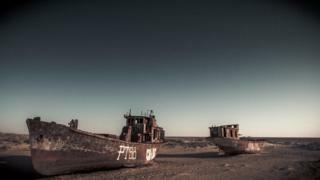 The Aral Sea has shrunk to 10% of its former size - an area of water as big as Ireland has been lost. But it's not just a way of life that has been affected. The captain waves his hands above his head: "It's not like before, the weather is bad, there's all this dust in the air". When Dr Yuldashbay Dosimov first came to work at Moynaq's hospital in the 1980s the shoreline was already 20km (12 miles) away. He remembers the illnesses that were specific to the region: "Respiratory problems, tuberculosis and kidney problems were widespread. Until recently, many children died of diarrhoea". The Soviet authorities who expanded Uzbekistan and Kazakhstan's cotton industry did not foresee that herbicides and pesticides from their new plantations would run off into the rivers around them and end up in the Aral Sea. Contaminated drinking water caused many problems and these were exacerbated when the water retreated. As the sea dried up, toxic chemicals from the cotton industry were left exposed on the sea bed. These were carried through the atmosphere by sandstorms and inhaled by people across a vast area. Locals experienced a swathe of health issues ranging from stunted growth, reduced fertility, lung and heart problems to increased rates of cancer. For example, one study concluded the occurrence of liver cancer doubled between 1981 and 1991. Another investigation found that by the end of the late 1990s infant mortality was between 60 - 110 out of 1,000 births, a number much higher than the rest of Uzbekistan (48 per 1,000) and Russia (24 per 1,000). For decades, these illnesses were an open secret. 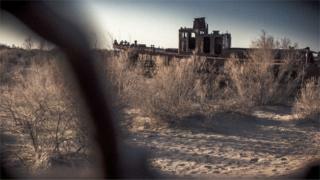 The authorities only acknowledged the disappearance of the Aral Sea after the fall of the Soviet Union. When they identified the problem, they started work on a solution. And it's a solution that Dr Dosimov hopes will radically improve the wellbeing of the Karakalpak people. "They have to lessen the impact of the dried up sea on people's health and that's why they are planting saxaul trees". Several miles from Moynaq two tractors are inching across the horizon side-by-side. They are scratching long lines into the salty sea bed that 40 years ago would have been 25m (80ft) underwater. On the back of each tractor, a young man grabs a handful of seeds and feeds it into the thin trench. "No matter if it rains or shines, we have two weeks to plant a hectare (2.4 acres)," says one of the men. "It's been cold and rainy lately, but we won't leave until we reach our goal". The men are sowing saxaul seeds. 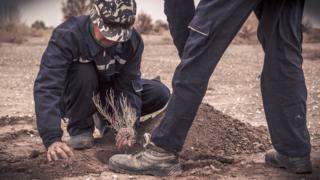 The saxaul is a shrub-like tree native to the deserts of central Asia, and now the first line of defence against climate change in Uzbekistan. "One fully grown saxaul tree can fix up to 10 tonnes of soil around its roots," explains Orazbay Allanazarov, a forestation specialist. The trees stop the wind picking up contaminated sand from the dried up sea bed and spreading them through the atmosphere. The plan is to cover the entire former bed with a forest. Image caption Orazbay Allanazarov believes the humble saxaul tree can help the Karakalpak people of Uzbekistan. "Here almost one in two trees has survived. This is good." He doesn't hide his excitement as he strokes the branch of one white-grey shrub that stands two and a half metres high. It's a long term project - this row of saxauls was planted five years ago. "We chose saxaul trees because they can survive in the dry and salty soil," he says. The trees are planted in rows, 10m apart, so that when they mature and release seeds of their own, the gaps between the rows will be populated too. 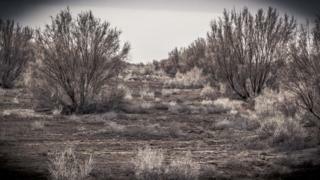 Until now around half a million hectares of the desert have been covered with saxaul trees. But there are still more than three million hectares to be covered. At the current pace, it could take 150 years to grow a forest here. "We are slow," admits Allanazarov. "We need to speed up the process. But for this we need more money, more foreign investment". Like the seasoned fishing captain Almas Tolvashev, Orazbay Allanazarov knows the Aral Sea may never come back. But at least now there is some hope that the Karakalpak people's quality of life can be improved - a lifetime after a decision was made to choose cotton over fish.